A wonderful Irish bangle made from sterling silver and adorned in clear Swarovski® Crystals. This beautiful Claddagh bangle features a cuff style bangle with a Claddagh emblem at either end. The Claddagh emblems are encrusted with bright sparkling clear Swarovski® Crystals. This simple but elegant design can be worn day or night. The Claddagh is a symbol of Love, Loyalty and Friendship. 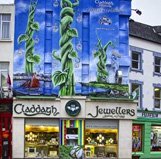 The tale of the Claddagh is a romantic story of Richard Joyce, who was captured by pirates from the Claddagh village in Galway. He was sold to a goldsmith and upon his release and return to Galway, he presented his true love with a Claddagh ring. Today, the Claddagh emblem is seen on lots of different types of Irish jewellery. In Ireland, it was a tradition for a mother to gift her daughter a Claddagh ring or for a partner to buy a Claddagh ring for his love. She wears the ring proudly to show the world the status of her relationship. Today, many people wear the Claddagh emblem in many forms and it is often bought to celebrate your Irish heritage. This beautiful Irish bangle is the perfect gift for you or someone you love.